What I Thought: Queen of Shadows. A monster of a book, with so much that goes on. There is not a moment when this book isn't action packed. We start off with Celaena or Aelin, whichever you prefer to call her, heading back to Rifthold, where Chaol is now working solidly with the rebels, Aedion is still imprisoned and Dorian is... well let's not go there lest I tear up again. There is a lot of changes that happen in Queen of Shadows, and some characters become a lot more important. We still follow multiple points of view, even some are just mere snippets of the character, but each one equally important. Some of these characters show different sides, and some end up being entirely new people. Queen of Shadows closes some doors and opens about a million more. 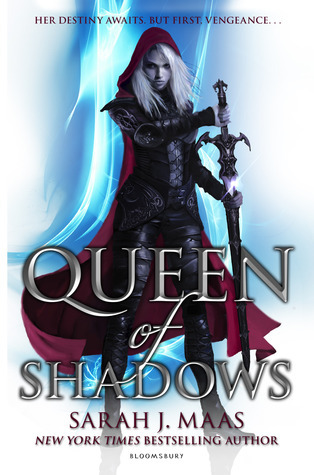 If you love this series, are in love with it's characters then you will definitely love Queen of Shadows. Buy it, devour it, and lets all mourn the year long wait we again have to suffer through. Long Live Queen Aelin of Terrasen! The Good: This book picked up much more that Heir of Fire did, and it was really hard to put down, especially towards the end. Seriously guys, just bust this baby out in one sitting, or the not knowing may actually kill you. The Bad: Having to wait another year for the next book, and not knowing exactly what to expect. Also, I am SO NOT on board with Celaena (Aelin) and Rowan. No no no no no. Just, no. I loved this book so much! Just everything about it was so good and I cannot wait for the next one!